Under the Big Oak Tree: Wordless Wednesday ~ Play Like a Pirate! Argh! Grace has loved all things pirate for about a year and a half now. So much so, that Argh! was one of her first words! She could tell us what sound an elephant makes, what does a doggy say, and what does a pirate say?! While I'm thrilled that Grace is a girly-girl, I am very pleased that she doesn't always have to be a "princess"! My parents were stumped as to what to get Grace for her birthday this year and asked for some ideas. 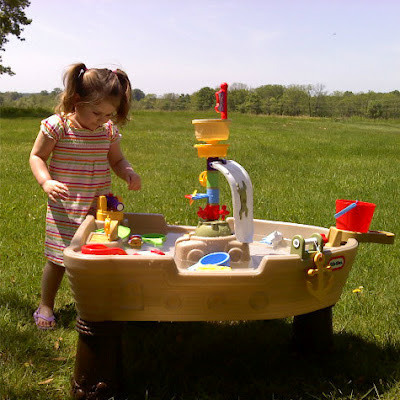 Remembering how much Grace enjoyed her first water table from a couple of years ago and adding in her love of pirates, I knew that a larger water table, shaped like a pirate ship would be the perfect gift for my parents to give her. It was really chilly the weekend (and week following) her birthday, so we first set it up in the living room. Without water. :) She enjoyed playing with it a lot, so I knew she would be really thrilled once it was outside and filled with water! I wasn't wrong! She loves it! Thanks, Mommom and Pop! The photo I'm sharing with you today, is from Friday. The weather was finally warm enough for splashing in some water! This is before she really started getting soaked...and the first of three DRY outfits that day! Our 3yr.old DGS is a water baby! Looks like she is having a great time! We are looking at water tables for our little one and would love to get a sand/water combo table for outdoors. I am stopping by from Outdoor Wednesday. Have a great week! What fun! It looks like the perfect gift!